I love a chart week like this one. Four future top 10 singles - three of them top 5 hits. And I actually like all of them! From a Stock Aitken Waterman-sounding cover version to an emotional duet by two of Britain's most respected singers; the debut single by a songwriter-turned-vocalist to the second hit for a two-hit wonder, the new songs covered most bases and would quickly be among the biggest sellers in the country. After four weeks of The Bangles and Kim Wilde playing swapsies at the top of the chart, the biggest selling single this week in 1987 was "I Wanna Wake Up With You" by Boris Gardiner. The slushy ballad spent a solitary week at number 1 after a 19-week climb up the top 100. I'm not sure why this 1985 single from the man who'd recorded the original version of "I Can See Clearly Now" (number 3 in 1972) took so long to reach the top 100, but it didn't get any further. A number 7 hit in 1979 for The Pointer Sisters - their first single as a trio - "Fire" had never been released by its writer until this concert version from Live/1975-85. I've never understood why this follow-up to top 20 hit "The Way It Is" performed so dismally in Australia. Yes, it'd also flopped in the US when released as Bruce Hornsby And The Range's debut single in 1986. But "Every Little Kiss" ended up reaching number 14 on the Billboard Hot 100 when re-released in 1987 (after "Mandolin Rain") - a case of a good song just needing a receptive audience. In Australia, the song about a long-distance relationship didn't find that audience. Or maybe people just bought the album instead. Although it only reached number 20 on the albums chart, The Way It Is was a solid seller until August. I've mentioned before that China Crisis is one of those bands I probably should like, but whose music has always passed me by. The first single from the British synthpop band's fourth album, What Price Paradise, "Arizona Sky" is the song that comes closest to exciting me, but I feel like there's something missing. The single also came close to giving China Crisis a third top 50 hit, spending six weeks just outside in the 50s instead. In a case of life imitating song title, Carly Simon came back around to the Australian top 50 for the first time in seven years with the title track from her 13th studio album. After a short-lived deal with Epic Records, which produced one album in 1985, the '70s hitmaker signed to Arista with much more success. Synth ballad "Coming Around Again", which was featured in the Meryl Streep/Jack Nicholson film Heartburn, made the US top 20 and UK top 10. In Australia, the song advanced to number 34 before dropping back and then, er, coming around again to rise to its eventual peak. It shouldn't surprise me by now to recall that many bona fide Australian classics weren't actually that commercially successful. Just like "Throw Your Arms Around Me" and "Sounds Of Then (This Is Australia)" in 1986, arguably the most famous song by country singer John Williamson was a chart disappointment, not even making the top 40. And like the Hunters & Collectors song, "True Blue" had more than one chance to become a hit. Originally released in 1982 on the best of album of the same name - and apparently issued as a single - "True Blue" was re-recorded in late 1986 and included on the Mallee Boy album. This time, it picked up some momentum, aided by its use in a series of ads promoting the Australian Made initiative, but fell short of becoming a hit single. Mallee Boy, meanwhile, was doing much better. This week, it spent its second week inside the albums top 10 and finished 1987 as the year's 24th biggest LP. It's obvious what Mushroom Records saw in Chantoozies, who'd formed to perform at member Tottie Goldsmith's 25th birthday party. The band, with four female singers sharing the lead, could be Australia's answer to Bananarama. And their remake of Redbone's 1971 song "The Witch Queen Of New Orleans" (number 17 in Australia) would be their "Venus", right down to the drum patterns and unison vocals. 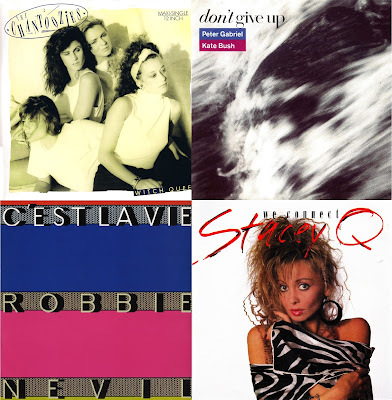 More frothy pop now and the second top 10 hit for Stacey Q. Like "Two Of Hearts", the just-as-infectious "We Connect" reached number 7 in Australia. The single did way better here than in America, where it crawled to number 35 (compared to the number 3 peak of "Two Of Hearts") - and that was even after Stacey made a return appearance as Cinnamon on sitcom The Facts Of Life to perform the song. In Australia, the number seven had proved to be lucky for Stacey so far, but subsequent singles peaked instead in the 70s, making her a two-hit wonder. Just before I wrote this week's post, I was finishing off transcribing my interview with songwriter-turned-singer Julia Michaels (who's written a stack of massive singles for other performers in recent years). What I didn't realise was that before he reached the top 5 in Australia, the US and the UK, Robbie Nevil had also worked as a songwriter (although I did know that's what he did when the hits dried up for him a few years later). "C'est La Vie" was actually one of the songs he'd earlier handed off to another singer to perform, recorded by R&B artist Beau Williams in 1984. When he landed his own record deal, Robbie included his version of the song (with a little help from some fantastic backing singers) on his debut album - and it got his career off to a flying start. His last single, the excellent "In Your Eyes", had barely registered on the top 100, but Peter Gabriel soon found himself back in the ARIA top 5 with this tender duet with Kate Bush. About as far removed from the exuberance of "Sledgehammer" (both musically and visually) as you could get, the understated "Don't Give Up" told the story of a husband's unemployment from two perspectives - the man's anguish and his wife's resilience. Peter had originally approached Dolly Parton to perform alongside him, but when she declined, he enlisted fellow Brit Kate, who'd last been seen on the chart two years earlier with top 10 hit "Running Up That Hill". According to Peter, he asked the permission of his then-wife, JiIl, to embrace Kate for the duration of the video due to the rocky state of his marriage at the time. I can't say "Don't Give Up" is one of my favourite songs, but I do like it - and certainly a lot more than the 2006 remake by Shannon Noll and Natalie Bassingthwaighte (which actually peaked higher, reaching number 2). Next week: the song that would serve as the theme to a new music show... for the next 30 years, plus one of the year's biggest hits not to reach number 1 and the solo debut of a singer who'd reached number 1 with his former band. True Blue! I can't believe that rubbish ever charted. How Williamson could sing lyrics like "Hey true blue, is it me n' you, is it mum n' dad, is it a cockatoo" with a straight face is beyond me. Embarrassing! I like the Johnny Nash song, though I definitely wasn't expecting to. I knew 'Every Little Kiss', though didn't think I did. It should have charted higher. 'Working With Fire and Steel' is the only China Crisis song I think I know, via a Countdown repeat, but love it. This one's OK. It's surprising that Carly's 'Why' didn't chart here. The bass line of 'Witch Queen' is very 'Venus' too; though the song sounds much more cheaply-produced than 'Venus'. Although very similar to 'Two of Hearts', 'We Connect' was another slice of synth-pop perfection. In Australia, we had the just over 5 minutes long Dance Radio Edit as the single version, with the middle instrumental bit lasting nearly a minute and a half, which I prefer to the edit used in the video. It's a shame she had no further hits. I remember listening to a Kate Bush J-File on Triple J in '96 for nearly 3 hours, hoping they'd play 'Don't Give Up', which I don't think I'd heard since 1987 at that point, so I could record it. Thankfully, they did. There was a second, more boring, video filmed for the US market. The Shannon Noll remake was truly awful, and it's a slight upon this country that it peaked higher than the original. Every Little Kiss was covered in the 90's by Sara Evans, i really like that version!! !